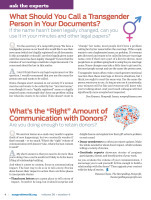 Home > Membership > Nonprofit World > What Should You Call a Transgender Person in Your Documents? What Should You Call a Transgender Person in Your Documents? If the name hasn't been legally changed, can you use it in your minutes and other legal papers?